Even more *ONLY CLASSIC* books from the UK. 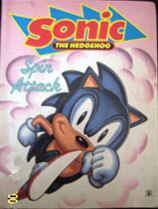 In the middle and early days of Sonic, Brittain was by far the most prolific nation for publishing. They defenetely beat out the USA and even Japan, for hardcover, softcover, activity and children's Sonic the Hedgehog stories. Try to get ahold of these while you can, books make a great addition to your collection. What makes these especially nice, is that if you're looking on Ebay auctions, they don't tend to skyrocket in price, so you can still aquire them reasonably. But how much longer will it last? 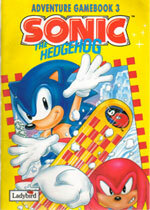 "Stay Sonic" by Fantail Publishing. There is no credited author, so this is likely to be a compilation. The back has been kept large, so you can still read it. It seems this book exists to perpetuate (the now discredited/unofficial) story that Sonic was brown and "Robotnick" was nice, until his experiment went wrong with the Chaos Emeralds. 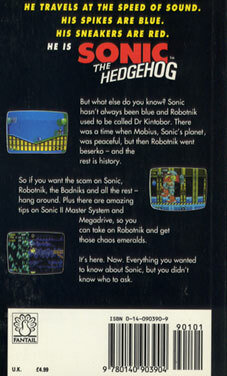 It also has tips for Sonic 2. 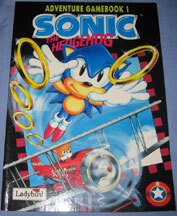 Blurb: Sonic the Hedgehog & Ladybird join forced to bring you some fast, furious, frantic and fun-filled radical action! The page at right looks like a final one, where Sonic tells Tails he did a good job telling the story. What's the long word at the end? Sonic saying 'bye' in several languages, and that anything that's not him, is too slow for him. Yes, the Tails looks as goofy and terrible as you think he does. Summary: In this short story, the tale of how Sonic became blue and fast. The pages are illustrated, mostly completely, with text on top and next to the art. In this rendition of Sonic's past, Tails dictates the story to the reader. It starts with Sonic playing a game of hide and seek with his Flicky pals and burrowing into the secret lab of Ovi Kintobor in an attempt to hide. Sonic befriends the good Doctor and learns about the Chaos Emeralds. Kintobor tries to stabilise the emeralds using the rings found in game and also constructs Sonic a treadmill of which he can run on. This treadmill is the source of Sonic's speed as he got faster and faster on the machine. Eventually, as he surpassed the speed of sound, his body became blue and streamlined from the shock waves of the Sonic Boom. Kintobor designed special sneakers for Sonic to prevent friction. After setting up Sonic's backstory the book proceeds to set up Robotnik's. Sonic finds a rotten egg in the fridge of Kintobor's lab and proceeds to give it to the Doctor, causing him to type incorrect data into the machine and resulting in an explosion. This explosion fuses Kintobor with the egg and forms Robotnik. The story then goes on about how Robotnik built robots to destroy Sonic, but never succeeded, which pretty much ends the story. A fun little version of Sonic's past which many like to adopt. Info by Ota. This is the version that has the emeralds as evil, hence, SuperSonic being a type of ultimate evil as he was in the FleetWay comics. This was later dispelled by SonicTeam's official plots, but since those didn't exist at the time, companies just made up whatever they wanted. This is one of those origens. 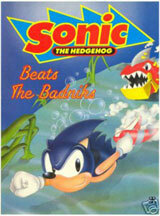 Here's an interesting one you don't see much "Sonic beats the badniks". This is likely from 1994, and may have been published by Ravette in the UK. 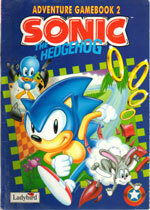 It contains the first 4 stories of the UK Sonic The Comic. 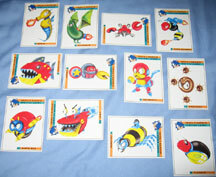 These are "Badnik Spotter" cards. Each one has the enemies' name on it, and number. These are just various enemies from around Sonic 2. They are all properly labeled according to the English names. They're not 100% well drawn, but they are fairly good. Are there descriptions on the back? The second book is "Zone Rangers" by James Wallace, this time by Puffin Books. 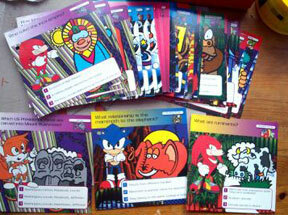 Eggman is hurling spears in the jungle, as Sonic and Tails swing on a vine. (no one said these had to make sense!) The cover art, while nonsensical, is pretty well done. All zones on nightmare alert? Robotnik is turning all zones into a nightmare of pollution and destruction. His Mobius Mega Trash Plan can only be stopped by Sonic, Tails and You! You have to use all your speed, skill and wits to help Sonic save the day. But time is of the essence as Mobius is decaying with every second! Are you up to the challenge? 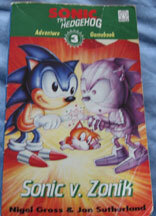 Sonic appears to be fighting "Zonic" who seems to be made of stone or metal or something. Sonic is rather mutant here too, and Tails is climbing out of a glowing hole in the ground. What's this all about? Metal City Mayhem Adventure Gamebook This is the first of a series of "Choose Your Own Adventure" type books. How many are in the series? What do you have to do? This one looks like it is by James Wallis. How do the books work? There are small story pieces on each page, followed by questions of what you should do. Example: "Tails is sleeping! Sonic has to save him, but how? Let the machine run over Tails and explore alone? Turn to186"
These are also somewhat illustrated, with stock art and some full page illustrations. The fourth book in the series is "The Zone Zapper" by Nigel Gross and John Sutherland. This was published in 1994 by Fantail books. This means the other 3 above, were earlier. Sonic chaeses a wierd eggish Eggman over red lava or a machine. Each one is rather confusing. Blurb: Is it a bird? Is it a plane? No, it's Robotnik. It's not unusual for Robotnik to go around messing up the Green Hill Zone. But this time he's built a brand new machine that turns everything good into bad--Even Tails! Sonic faces the fight of his life with his best friends. Will they survive, and will he? You need to think fast and act quickly. Book 5 is "Theme Park Panic" by Marc Gascoigne and Jonathan Green. What sort of a theme park features a mine cart trhough desolate hills? That is not a rollercoaster. Also Amy Rose in an ankle-length house-dress has been tied to the tracks. With only inches to spare, can triangle-head Sonic save her? Blurb: "An amazing new theme park has opened on Mobius. But for Sonic and his pals it turns out to have more than the usual thrills and spills, thanks to the devious mind of Robotnik. 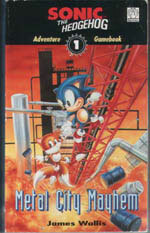 The crazed inventor plans to wipe out all the zones on Mobius and this time he's determined to succeed." There are 6 books known in the series. "Stormin Sonic" by Marc Gascoigne and Jonathan Green seems to mean sand stormin' Sonic, as you can see a buried burger joint. The chrome and lasers scorpian shows an upgrade in the art, but what's with all the unflattering angles for poor Sonic? Here, next to the previous book series is another billing itself as "Adventure Gamebook 1" They can't be from the same series, but the photos are together to let you know SonicGear did not make any mistakes. This is likely around the time of Sonic 2, due to Tails' plane making a nicely drawn appearance...its too bad Tails himself looks like a bogus stock-art head...Supposedly, this first one is the best. Blurb: Sonic the Hedgehog and Ladybird join forced to bring you some fast, furious, frantic and fun-filled radical action! Summary: Game Book. Contains "Find the" puzzles and various other quizzes. The game is played by solving problems to advance to pages in the book which it tells you to go to. The art is pretty much all drawn, not stock and every page is a full picture in bright colours. The storyline follows Sonic 2. Photo & Info by: Ota. Blurb: Warning! Sharp thinkers & cool kickers only need apply! Leap on-board for another furious chase with Sonic the Hedgehog as he comes head to head with Dr Robotnik. The devious Doc wants to rob Angel Island of all it's colour & Knuckles is trying to get in on the act as well! Pages of power-packed games lead you on a path full of pitfalls. Only quick thinking can speed Sonic to a true blue breakthrough! The decisions you take are make or break ones! Attempting an Adventure Gamebook could seriously improve your cool! Blurb: Warning! Sharp thinkers and cool kickers only need apply! 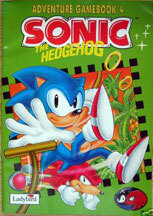 Can you keep up with Sonic the Hedgehog as he chases after Dr Robotnik and tries to keep out of Knuckles' way? The dodgy Doc has stolen the colour from Angel Island, and Sonic's not about to start living in a monochrome no-hope zone! You'll need to get smart though - page after page of mega-games will lead you on a hair-raising trail. The decisions you take are make or break ones! Attempting an Adventure Gamebook could seriously improve your cool! Summary: Game Book. Same kind of puzzles as number 3, with same colour-no colour page layout. The story once again follows that of Sonic 3. Same full picture pages. Photo & Info by: Ota. These 'adventure gamebooks' are more complex than you might imagine. The 'puzzles' are more like a table-top RPG type thing where you roll dice, do math, and write down various statistics! You determine Sonic's stats at the start and they help determine your path, possibly even like Dungeons and Dragons type of game. The book tells you what pages to go to, by asking how the problem worked out or what you decided. There are multiple endings and you can even die on them, like you can the games! It is all very complex. Apparently, the first one was the best. If you want to learn more, you should go to www.gamebooks.org , as this site is made by a pro gamebook reviewer (yes it is some type of genre of book! Though it may be little known) he reviews all of them, and explains things with pictures and stats! Very useful. Credit to Sofox for finding the gamebooks review site, and explaining the books, as above!